The "mother of all airports," as a noted British architect called Tempelhof, is about to close its runways forever. It had no peer and no rival, and it is probably not an exaggeration to say that it touched more lives than any other structure of its time. Alas, while Tempelhof occupies a special place in the hearts of many BKs, younger generations are unfamiliar with it's illustrious past. And if West Berliners view Tempelhof as a symbol of freedom and are grieved to see it go, East Berliners harbor no such affections. Time marches on. 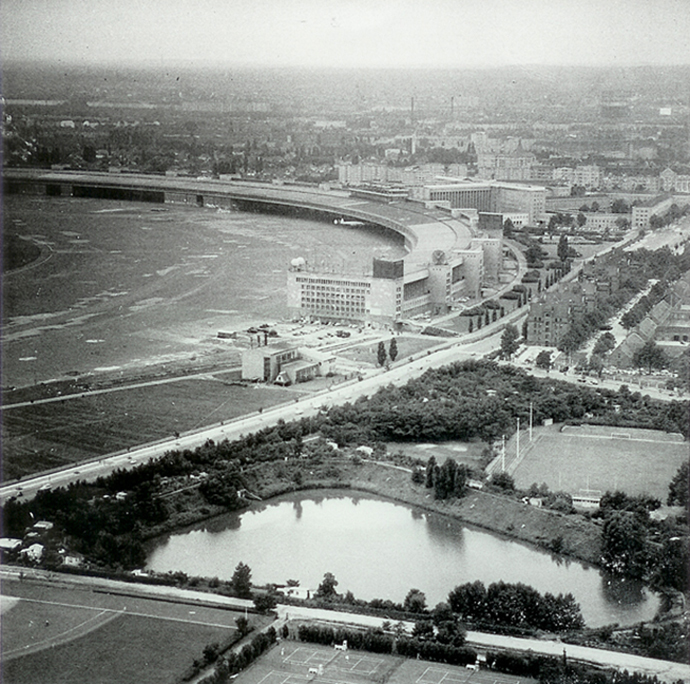 Conceived as the gateway to Europe by Nazi architect Albert Speer, the mile-long gently curving facade with cantilevered hangars opened its doors in 1941. Its tiered roof was actually designed as a lofty viewing stand to seat spectators of national extravaganzas, however, the coming of war interrrupted its completion. The cavernous facility was used to assemble Stuka dive bombers and Focke Wulf FW 190 fighter planes during World War II. Conrol of Tempelhof was turned over to US Forces on July 4, 1945. American Overseas Airlines started the first commercial air service after the was with a flight from New York on May 18, 1946. The Berlin Blockage/Airlift, which lasted from June 26, 1948, to May 12, 1949, brought world fame. (During the airlift, aircraft landed at intervals as short as 90 seconds.) On January 5, 1950, Air France launched Berlin flights with a four-engine Languedoc. [Several BKs were treated to a belly landing by Air France as they lunched in the Tempelhof PX cafeteria one foggy day in 1957-1958 (senior moments preclude giving the actual date).] On July 10, 1951, the Airlift Memorial was dedicated. It was erected in honor of the 31 Americans, 40 Britons and five German pilots who lost their lives during the Berlin Blockade. On December 2, 1964, Boeing demonstrated its prototype 727 as the first jet transport plane to land at Tempelhof. The U.S. Air Force C-5A Galaxy landed as the first wide-body aircraft on September 17, 1971. The airport was opened to non-allied air traffic on October 3, 1990. US Air Forces left Tempelhof in June 1993, and the U.S. Army closed its Berlin Army Aviation Detachment at TCA in August 1994. Closure of Tempelhof is attributed to declining services as airlines opt to use more modern facilities in Berlin Schoenefeld International Airport, renamed Berlin Brandenburg Internationals Airport and a state of the art facility, is replacing all major air facilities in the metropolitan area. On the lighter side, it undoubtedly has been Europe's most eccentric airport, boasting its own transvestite revue show, a tank full of edible carp, and sundry other amenities that few of its rivals can match. The transvestite show is reputedly "a bit like the Moulin Rouge but with men." Not all that unusual for Berlin!